Prime Minister, Susuga Tuilaepa Sailele Malielegaoi officially launched the second Science Teachers Accelerated Programme (STAP II) at USP Alafua Campus in Apia this week. The programme offers scholarships for local science teachers to undertake a Bachelor of Science Programme at the University of the South Pacific. 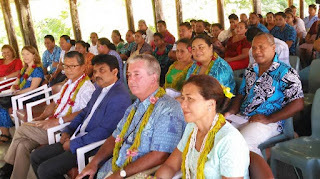 STAP was initiated from a partnership by the Government of Samoa and USP in 2014, where the first group of 51 teachers graduated with a Bachelor of Science degrees. “I am very happy to continue this strong and effective partnership with the University of the South Pacific and we are happy to inform that we are now offering 60 more scholarships under STAP II,” said Tuilaepa. Tuilaepa said the Government of Samoa is doing its best not only to advocate science in Samoa and the region but to deploy strategies and implement plans to intensify the growth of science in Samoa. A Memorandum of Understanding was also signed by the Minister of Education Sports and Culture, Afioga Loau Solamalemalo Keneti Sio and the USP Dean for the Faculty of Science Technology and Environment, Dr Anjeela Jokhan.